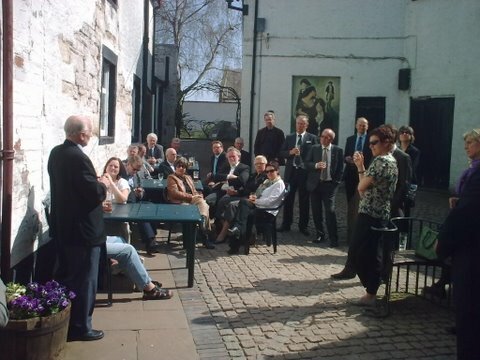 In association with the Globe Inn, members of the Howff Club are please to give parties of visitors short tours around the places of note which Robert Burns frequented and visited during his time in Dumfries. The tour is tailored the the requirements of the party from just the Globe Inn history and its Burns association, or to include the Burns house and St.Michaels Church, graveyard and the Robert Burns mausoleum. 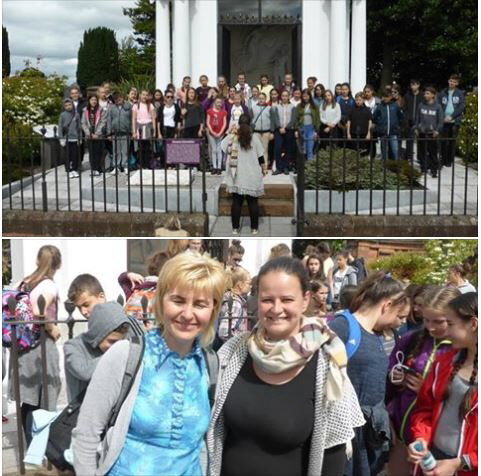 The club was asked by the Presbytery of Dumfries and Stewartry to meet a party from the Voxiuventutis School from Debrechen in Hungary and provide a “ten cent tour” of the places on Burns interest in Dumfries. 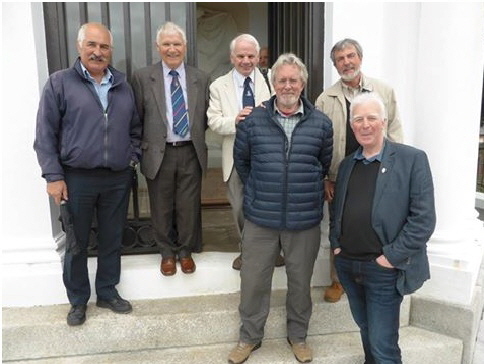 45 pupils and 5 adults and a rep from the presbytery turned up at the Globe on Saturday 24th June and were met by Bill Welsh, Kenny McKinnon, Gordon Johnston and David Smith. The group was slit into manageable batches for a tour of the Globe and fortunately, the two teachers gave simultaneous translations of members’ explanations as their Hungarian was limited. Whilst in the Burns Bedroom, Bill Welsh reported a strange happening when a mirror and a bible appeared to jump of a table without human intervention so he quickly ushered the party out. 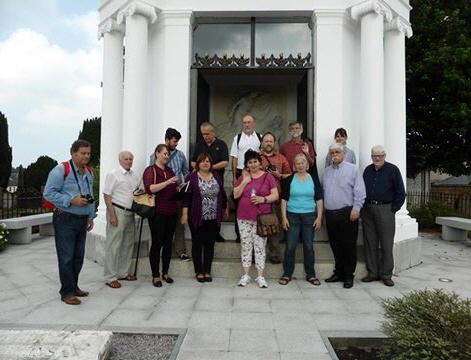 Then in glorious sunshine, the group moved on to Burns House, Jean Armour statue and Burns Mausoleum where club members were delighted that the pupils turned into a choir and sang a Hungarian folk song on the Mausoleum steps. Photos show the choir in full voice and two of the teachers whose names couldn't be pronounced let alone spell. 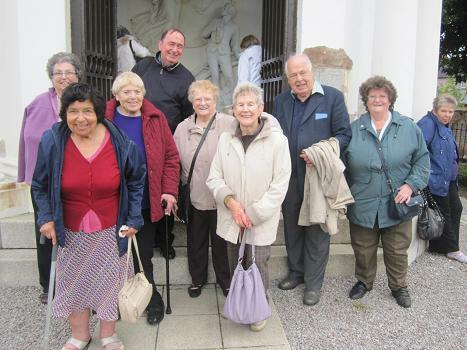 The club was asked recently by the Presbytery of Dumfries and the Stewartry of the Church of Scotland, to provide a walking tour for a party from Hungary on an exchange visit to Dumfries. 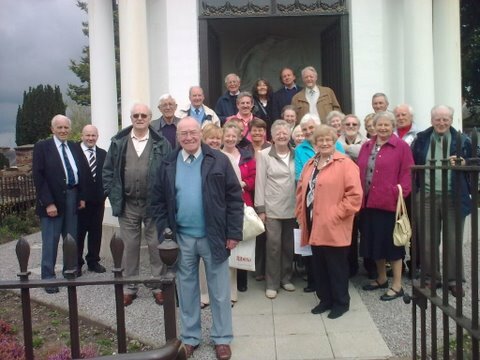 Glorious weather on Sunday 29th May set the scene for a group of visitors from Gourock Jolly Beggars Burns Club. Following lunch at the Globe, they marvelled at the club’s library and artefact collection and the story of the clubroom history before ambling up to Burns House, Jean Armour statue, St. Michaels Kirk and Burns Mausoleum then returning to the Globe for some refreshment. Before departing, the visitors made a generous donation to club funds. 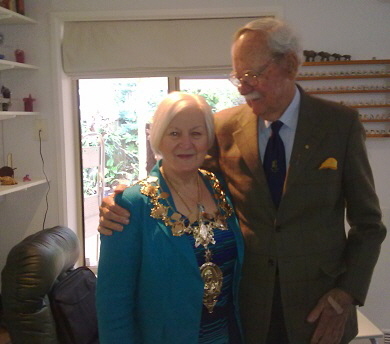 Photo shows Dr John Menzies and Mrs Carol Menzies from Camperdown, Victoria, Australia. John is president of the Camperdown Burns Club. They were on a tour of Scotland and naturally visited Dumfries where they were met by members and accorded the ten cent tour. They both accepted the gift of a miniature bottle of the club 125th anniversary whisky. 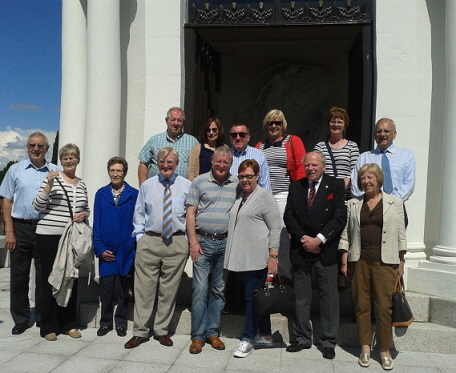 A party from Sandyford Burns Club, Glasgow came to call on Sunday 13th July and were met by Bill Welsh, Gordon Johnston, Dan Cook and David Smith who conducted the ten cent tour. 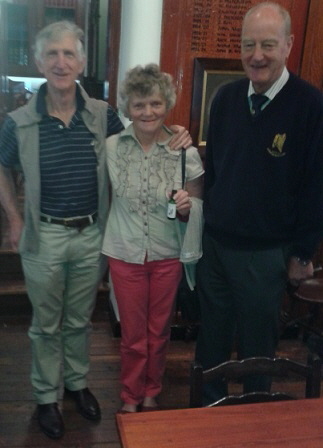 Also present were Billy Graham and William Johnston who were keen to learn the secrets of the tour. The visitors proved to be knowledgeable Burnsians and appreciated access to Burns Mausoleum and the tour of the Globe Inn. Two distinguished lady teachers from St. Petersburg, Russia, passed through Dumfries on 21st August and both being Burns enthusiasts, naturally called at the Globe Inn. Club Librarian and Lothario, Gordon Johnston, was pleased to squire the ladies to the places of interest in town and later, they met some club members in the Globe. 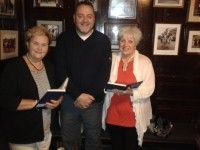 President Ian McIntyre presented Tamara and Alla with a copy each of “A Wee kist o’ Verse”. Gordon, who hopes to renew acquaintances when he visits St. Petersburg in 2014 with the St. Petersburg Forum, said that he can’t wait. 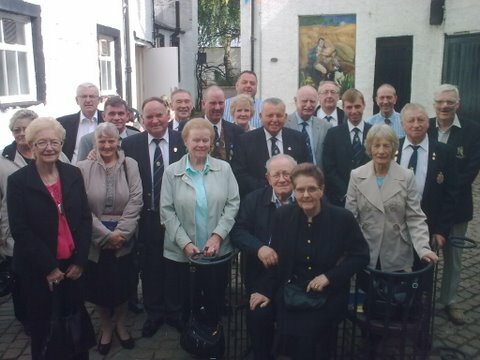 The first visitation in 2012 was from Greenock Burns Club (The Mother Club). 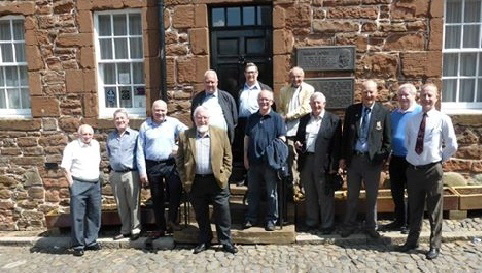 33 enthusiasts led by president Margaret Dickson arrived at the Globe Inn and were welcomed by SVP Godfrey Bedford, JVP John Clark and sundry other members. The party was split into manageable groups and ushered round the ten cent tour although some of the visitors decided to go shopping rather than take the cultural bit. Some disappointment was expressed regarding the Mausoleum being out of bounds but all agreed that the refurbishment was long overdue. Much interest was generated in the commemorative plaques at the graves of Burns’ contemporaries in St. Michaels Kirkyard but some adverse comment was heard regarding the deteriorating state of what is in fact a listed building. On return to the Globe Inn and the customary refreshments, members were invited to join the visitors for High Tea. Godfrey as senior member present, was presented with a copy of the catalogue of “Pictures, prints and personalities” of Greenock Burns Club. Photo shows a group outside Burns House with John Clark modelling the new club umbrella. Some of the Aberdonians at Burns Mausoleum. 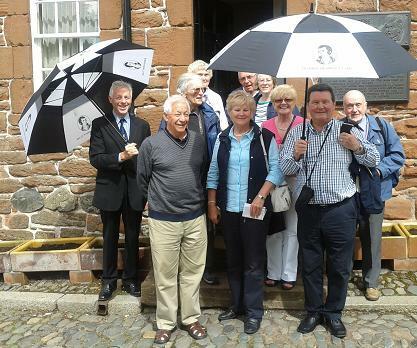 43 members of Aberdeen Burns Club visited Dumfries on 25thSeptember and were met by Howff Club members at the Globe Inn. Following a snack lunch, the visitors were marshalled into manageable groups and conducted round the club’s 10 cent tour. The Aberdonians were delighted to be given access to Burns Mausoleum and several recited from the poet’s works in tribute. Although a few of the party disappeared into Marks & Spencer, the visitors gamely made their way round the town centre, admiring the Burns Statue, Burns House and St. Michaels Kirk before some fetched up at the Hole i’ the Wa to shelter from the rain before returning to the Globe Inn to be shown the Burns Bedroom and the clubroom before their High Tea. Aberdeen BC president George Stevenson thanked members for welcoming his party and for showing them the places of interest. The Howff Club reception committee was Ian McIntyre, Dan Cook, John Lauder, Ken McKinnon, David Baird and David Smith. about the club's Jean Armour statue."